Thanks for visiting! Please explore our information-rich chiropractic site so you fully understand what chiropractic is, what chiropractors do and what you can expect in our office. Our Lynnwood and Mill Creek patients’ success is due to their commitment to living a wellness lifestyle through chiropractic care! We’ll teach you how to implement wellness into you and your family’s lives. Chiropractic offers natural relief of chronic pain, headaches, disc disorders and personal injury cases. Chiropractors help newborns, infants, teenagers, adults and seniors. 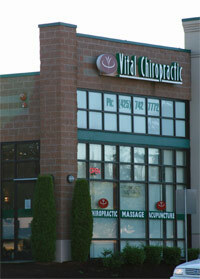 And health-conscious Lynnwood and Mill Creek families choose Vital Chiropractic Center Center. When you’re ready, call the Lynnwood chiropractors who help people whether they want relief or wellness. Find out for yourself why so many of your neighbors already have, call now! Excellent staff all around, always feel better after my appointments.